Photos from the weekend trips to the Ohane and Upper Upper. and some mid week shots from Spencer's Hole. 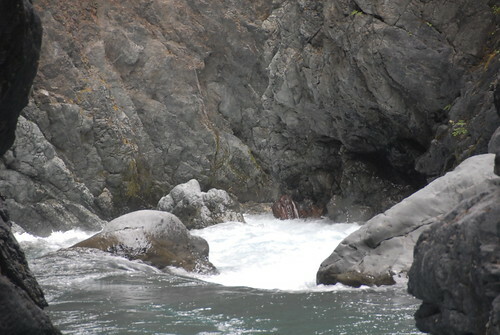 Why I Soloed the Grand Canyon of the Elwha..
Two weeks ago Jeff and I went up to the Olympic Peninsula to run a remote class V near Port Angeles, on the Elwha river. 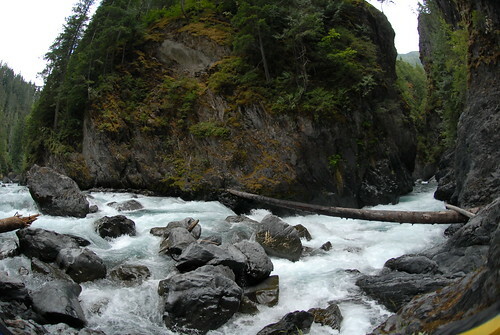 The run involves and 8.5 mile hike in with boats and once we get up there, we have to deal with two class V gorges with difficult or impossible to scout rapids. One rapid is called Nightmare because it is unscoutable. When Jeff and I got to Nightmare we were feeling very tired. Jeff was recently off a 41 mile 6 day class V trip and was mentally pretty fried and I basically stood up out of a desk chair, strapped a boat on my back and hiked many miles over reasonably difficult trails. EJ- " I think we should go, do you have any strong feelings about that"
Jeff- "I'm scared to death of that"
EJ- "Ok, lets start hiking"
What followed was the sketchiest few hours of my life to date. We had to ascend steep scree slopes with loose rock, no safety and nothing between us and the several hundred foot fall to the river. We attempted to climb with our boat and when that didn't work, to haul our boats up with ropes. Eventually one of the boats got caught on a rock and because they were tied together, we were forced to leave the both behind. There wasn't time and it wasn't safe to climb back down to the boats to free them. My camera was still in my boat. After we abandoned our gear we still had about 700 ft to the tree line going up the same nasty loose rock slide slopes. In a few places, Jeff had to climb first, then lower me a rope so I could get up. Eventually we just put our heads down, and scrambled up digging out hands and feet in. As long as we kept moving up, we made ground. If we stopped, we started sliding back. Once we made it to the tree line, we felt a bit safer but the terrain was just as steep. We stripped off our gear, scrambled up to the trail and hiked 6 miles back to the car, finishing in the dark. I walked funny for the next 3 days. Over the next week a few plans hatched and fell through and by the time the Saturday night rolled around, I was planning on heading back in to get my boat and a camera back. So on Sunday morning I set out with two ropes, and rappelling gear, hiked the 6 miles back up the trail and dropped over the side. About 8 rappel stations down I got to the boats, got them attached to me so while I rappelled the would be lowered as well. After a while of fiddling with ropes, I got both boats down to river level but had to leave both ropes tangled in something on the slope. 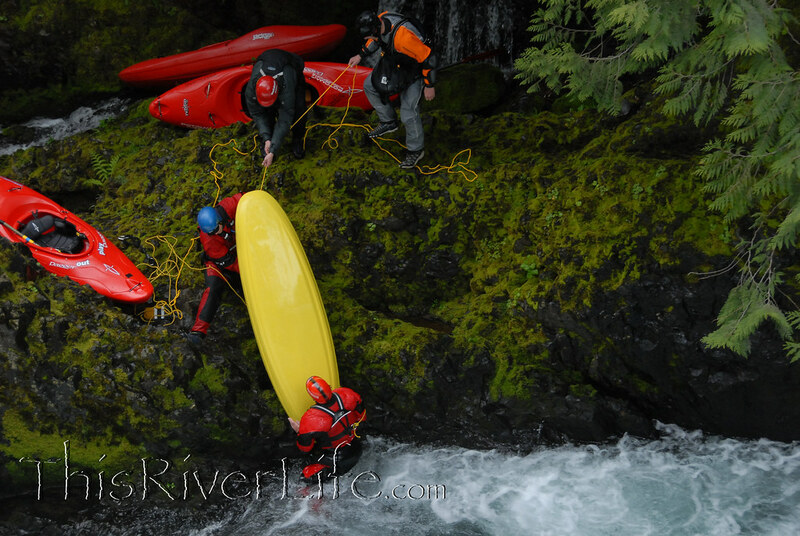 I secured Jeff's boat, packed up my gear, portaged the sieve that was the first rapid and set off downstream. I finished out the frist class V gorge, made one more portage and bank scouted once. 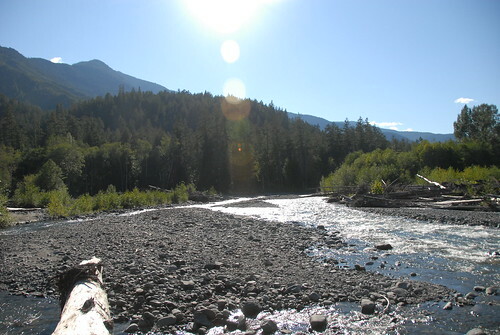 The river then opens into a broad valley, where I asked a fisherman how to find the trail out above the next gorge. After portaging a ways over logs in the valley, I came to and entered the second gorge, which I had intended to walk around, without having come to a trail. I paddled down to the first horizon line, decided I'd had enough of boat-scouting class V, turned around and paddles back out of the gorge, portaged upstream and bushwacked around till I found a trail. 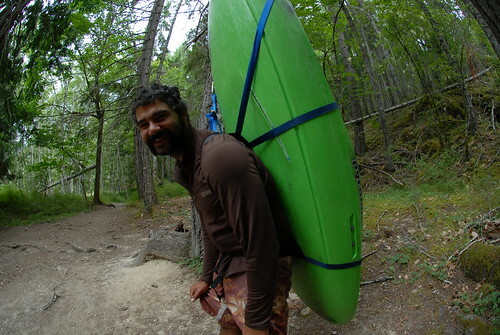 Once I loaded all my climbing gear and wet kayaking hear into my boat, it weighed around 100lbs or so. Carrying that up the steep 0.5 mile trail out of the gorge and up to the main trail took a little over an hour and was rather painful though once I reached the flat trail, it was easy going and fast back to the car. I had left the wedding I was attending in Seattle about 10:30 pm Saturday, hopped the 11:45 ferry from Edmonds and gotten to the Whiskey Bend parking lot at lot at about 3 am Sunday. I left the car about 8:30 am got back about 13 hours later at 9:30 pm with my boat and camera and paddle but had left behind Jeff's boat and my two ropes. I scarffed a bagel and drove back to Portland, stopping to rest somewhere, and arrived at about 5:30 am on Monday morning. And now I'm back at work.